When you decide it is time to have some friends over for a visitation, you are obligated to feed them if they are going to be there over a couple of hours. At least that is the way it works in Texas. The items required to have, as they say in the slick food magazines, a "festive buffet" are taco meat, shredded cheese, taco shells, warm tortillas, refried beans, guacamole, chopped tomatoes, onions, lettuce, and salsa. With these items, anyone can create tacos, chalupas, burritos and salad. For up to a half dozen people you can get by with two pounds of very lean ground beef. I prefer chuck. Cook the meat in a heavy skillet that has just enough oil to keep the meat from sticking. Crumble the meat as you put it in the skillet, and then use a spoon to keep breaking it down. As it cooks it will separate easier. Season with a heaping tablespoon of ground cumin, a teaspoon of black pepper and salt to taste. Add the cumin and black pepper to start and add the salt when the meat is just about done. You want the meat just starting to brown. It will be gray when it is done, and then it will start to brown. If there is excess liquid in the pan, either strain the meat with a sieve or a slotted spoon. Return it to the skillet and keep it just warm. Traditional in Texas is cheddar with just a little bite. You can find two hundred different kinds of cheese on display. For convenience, the best deal is pre-shredded cheddar in the plastic bag. You want to keep it cool so it doesn't stick together in a lump. If you have a deep fryer, you can get a gadget that will form the tortillas into the shells when you fry them. This is way too much trouble. Get the tortilla shells that come in the box and warm them according to directions. I would have both corn and flour tortillas. 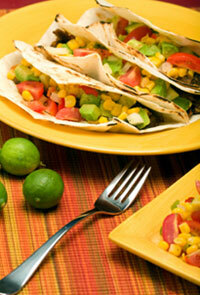 The corn tortillas should be made with yellow corn. The flour tortillas should be your brand of choice. The corn tortillas pretty much come in one size, but the flour tortillas can come in several sizes. I would go for the middle size. You might want a few of the big ones in case someone wants to build a burrito. The best way to warm tortillas that I have found is to use an iron skillet heated to just below "medium". Put in a stack of six or eight tortillas. Be sure to separate them before you warm them so they don't stick together. Warm the stack for three or four minutes and then turn the whole stack over. Divide the stack in half, turning the top side (which is now the warm side) into the middle of the stack so a new cold side will be on top. In a few minutes repeat the operation. This will get all the tortillas warm without overheating the ones on the ends of the stack. If you have a tight fitting lid for your skillet, use it. When the tortillas are warm put them in one of the styrofoam or other suitable tortilla warmers to keep them warm. You can warm tortillas in the microwave, but it makes them tough. Refried beans, or "refritos", are simply cooked pinto beans that have been mashed and cooked with lard. My vote is to get them in a can. Look for the brand that has the least fat content. Warm them according to instructions on the can. Peel and seed the avocados. Immediately add the lemon juice. This will keep the mix from becoming dark. Mash the avocados with a sturdy fork. Don't purée them; you want some small lumps. Add everything else except the tomato and mix well. Put one of the seeds in the middle of the mix, cover and refrigerate until serving time. (The seed will retard the time it takes for the mix to start turning dark). Get it in the jar. It saves a lot of work and some of the stuff in the jar is as good as homemade anyway. Around here you can get Pace's Picante Sauce. Get the medium, or medium and hot to fit all tastes. Wash the lettuce well and dry it. Remove the tough stems. Shred the head into a fine size. Keep cool. The onion needs to be fine diced to a size you can manage with a spoon. The tomatoes should be seeded before they are chopped fairly fine. You might want to have some minced jalapeños for those who want a little extra zest on their plates. As I said earlier, let the guest assemble their dishes as they see fit. If they want guacamole and refried beans in a crisp taco shell, so be it.